Then, it’s the 75th anniversary of the decree ordering the mass incarceration of Japanese-Americans during World War II. 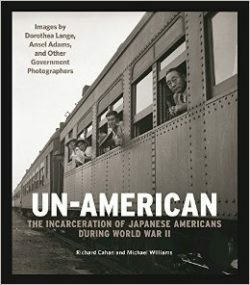 Richard Cahan tells us about his book Un-American: The Incarceration of Japanese Americans During World War II. It’s a collection with text of Images by Dorothea Lange, Ansel Adams, and other government photographers. The US started building fences at the border with Mexico in 1994. Then, as now, they do little to stop those who are fleeing violence and poverty for a chance at a better life. Now, Donald Trump wants to build a bigger wall. Current cost estimates range from $15 to $25 billion dollars, paid for by U.S. taxpayers (not Mexico!). But while it drains the US treasury of funds money that could go to infrastructure we actually need, like repairing America’s failing bridges or building mass transit, Trump’s wall is unlikely to actually keep people from crossing it. That’s what Kimball Taylor wrote last year in his op-ed, “History Shows Trump’s ‘Beautiful’ Wall Would be Worthless”. That conclusion is a result of his investigation into a strange phenomenon: the increasing number of bicycles abandoned across the border from Tijuana. 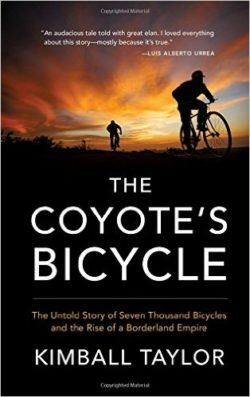 Taylor’s book, The Coyote’s Bicycle, is the story of how those bicycles got there, the rise of an ingenious operation smuggling people across the border and what part is being played by the black market, Hollywood, the prison system, and the military-industrial complex. He also shows that US domestic and foreign policy has a greater impact on immigration than any mere physical barrier can ever have. Kimball Taylor writes for Surfer Magazine and is the author of Return by Water and Drive Fast and Take Chances. Read excerpts from The Coyote’s Bicycle and see Kimball Taylor’s photos while reporting the story. Seventy-five years ago , President Franklin Roosevelt issued Executive Order 9066. With that order, the federal government began the forced incarceration of 110,000 Americans of Japanese ancestry. They were taken from their homes and communities and put into concentration camps out of the mistaken fear that they posed a threat to national security. The federal government sent some of America’s greatest photographers to document the forced removal and incarceration. Among them were Dorothea Lange and Ansel Adams. Now these photographs from our national archives have been collected in a stunning visual record of that terrible time, along with text by my guest Richard Cahan and his co-author Michael Williams. The book is Un-American: The Incarceration of Japanese Americans During World War II: Images by Dorothea Lange, Ansel Adams, and Other Government Photographers. Richard Cahan is a journalist and publisher of City Files Press. A previous book is Vivian Maier: Out of the Shadows.